Artist Vincent Moon participates in a ceremony for the video installation piece Rituals. In the foyer at HAU2, a group of BCB students – myself included – awkwardly took their mud-caked shoes off, aligned them up against the wall, as was instructed by a small cardboard sign and entered the installation space sock-footed. Rituals is the outcome of French artist Vincent Moon’s five-year long travels around the world, and explores the relationship of music to religious and cultural rituals in different societies. The space we entered was dimly lit and had large pillows scattered on the parquet floor. People were sitting comfortably and looking at the wall, where three video frames were being screened simultaneously, one next to the other. Settling in between reclining people whose faces we couldn’t make out, we turned our gazes towards the projections. HAU2 is one of three performance centers that were fused in 2004 to create Hebbel am Ufer Berlin. Since then it has become an international theater hub in the city. On a rainy Saturday evening, as part of this semester’s Berlin Weekend activities, we met at U-Möckernbrücke station in Kreuzberg and made our way towards the theater. We climbed several flights of stairs to a foyer where a small, elfish man was welcoming guests. This was none other than the artist who created the installation that we had come to see. His installation at HAU2 is shown as part of CTM festival in Berlin. CTM (Club Transmediale) has been up and running since 1999, showcasing digital and electronic art pieces with an emphasis on music and installation. In a city which runs on the bass beats of techno and electronic music, it’s no surprise that CTM is flagged as one of the central cultural events of the year. This year’s CTM festival is called New Geographies, and it explores today’s musicians’ “increasingly complex realities that result from the clash between their unique, physically bound local contexts and the boundary expanding effects of globalization and digitization”. Vincent Moon handed out lists of the 30-something different video pieces that would be screened in his installation, and explained that they would be played completely randomly. Only that way, he reasoned, would the installation do justice to each piece as having its own autonomous presence without imposing upon it a relationship with another specific piece. The different frames projected on the wall each played video pieces consecutively, while the audio balance in the room constantly changed, thus alternating the audience’s focal point on the images screened. Taking in rituals from Georgia, Brazil, Ethiopia and Indonesia (to name only a few), we were mesmerized. An old, wizened woman chanted and tattooed ritual participants in the Philippines. In West Africa, a group of extravagantly-dressed dancers sang and praised God while blessing the spectators in the room individually. After almost two hours of watching Moon’s masterful cinematography, we slowly crawled out of the room, individually processing our thoughts. The main thing that Rituals instilled in me was a deep sense of wanderlust. I wanted to immediately flag a taxi from Kreuzberg straight to Schönefeld Airport and hop on the next flight to India. The installation absorbs its viewers into the intricacies of travel and human encounters, and it’s magnetizing. But, as one of my friends pointed out, what does it mean for such a piece to be screened at a festival called New Geographies? There is something old fashioned in Rituals which falls into the troublesome realm of cultural voyeurism. 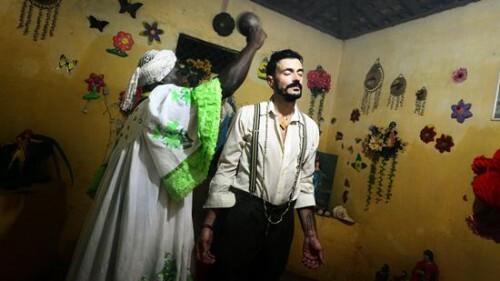 In creating an installation documenting a French artist’s travels to what he perceives as ‘exotic’ destinations, the piece depicts human rituals through the lens of a curious first-world viewer, gawking at faraway lands and customs which are, through their ‘exotic’ status, completely alien to him or her. After thinking it over, I found that I agreed with the criticism that my friend had put forth. But now, I realised, I had to reconcile my enjoyment of the installation as a video experience with the harsh assessment of it as an art piece. What responsibility do we take upon ourselves when viewing an artwork like this? And what, I wondered, would have been different if Moon had created it as, for instance, a piece of experimental documentary and not as an installation? Does its status as an exhibitional art medium change the way we can critique it? Rituals is a masterful and fascinating video piece. But taking it in should be done with a critical mindfulness of our perspective, sitting in the cultural capital of Europe in a comfortable and trendy exhibition space. While the installation is fascinating – both aesthetically and in terms of its contents, by neglecting to link ‘us’ and ‘them’ together it unintentionally shows the ugly side of globalization – the voyeuristic side, which exploits traditional communities in the frantic search for a ‘genuine’ experience. The CTM festival has completed its run for 2016. More information and events can be found here. hello there, very interesting piece you wrote. would love to exchange more with you, is there any way i can reach you in a different way? I got some concerns on some specific points you are making, maybe you didn’t read the text at the entrance of the exhibition though. my email is vincentmoon@gmail.com, thanks a lot.